Happy 2017! That's very weird to write if you ask me. I rang in the New Year in a very laid back way(thanks to a ton of rain rain) and am excited for what's to come this year although I know it will be a year of change. I am a sucker for inspirational things whether that be quotes on Pinterest, a new planner, or books and thought it would be fun to share some motivating books to kick off the new year with. With the free time provided during a break from school there is no better time to gain some inspiration and start the new year motivated than now! I love books of this nature that encourage you to keep a good perspective and inspire me to continue to be my best. So, if you have any recommendations for books of this nature I would love to hear them! Excited to try out these new books, though I read The Happiness Project and didn't really like it. It has been a number of years since I read it (while I was a counselor at summer camp one year) so I'd be interested to go back and re-read it and see what I think! Happy 2017 to you as well! This is the perfect time of year to read an inspirational book. I haven't read any of them, but will add them to my list. I think we are more "open" in January to new ideas, habits and suggestions. I definitely agree that people's perspectives are more open and optimistic during this time of year! I wasn't a huge fan of The Opposite of Loneliness, but loved You are a Badass! 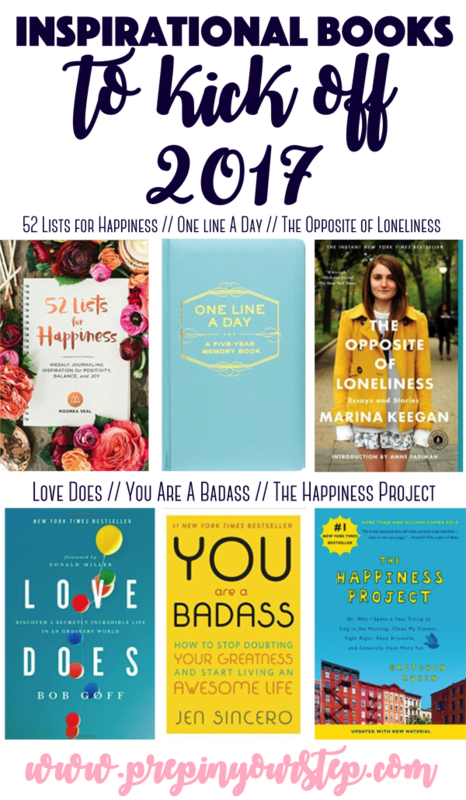 I may have to give The Happiness Project a read now :) Thanks for sharing these picks! So glad you stopped by! I hope that if you do read the Happiness Project that you enjoy it!! My roommate recommended it to me and we both LOVED it! I'm currently reading an ARC of The Happiness Effect by Donna Freitas. It examines how social media affects our perception of happiness. I'm not too far into it but I have found myself thinking about a lot of her points and agreeing with a lot of her observations. That sounds just up my ally! I will definitely be adding that to my list since I know that I can get caught up in the perception of others through social media! For the past year and a half, I've been writing down a memory from each day. That book would be a great place to compile them. Great roundup! I have a few of these on my reading list!